Cow Barn is a 4* Gold cottage that comfortably sleeps 4 and is ideal for a family with dog/s with its large patio and lawned garden. It has a private hot tub that seats 6 and looks out over the orchard catching the sun most of the day. Beautiful cottage set in a fantastic location. We really felt at home in this cottage and the attention to detail in decor did not go unnoticed. Hot tub was very luxurious and the owners were super friendly. Perfect, relaxing, cosy break in the country. Really enjoyed our stay was exactly what we was looking for. A peaceful, relaxing, cosy break in the country. Clean, friendly service, and enough mod cons to make a very comfortable stay. Location was lovely with amazing views down the local little valley at sunset from the hot tub. Lovely place to stay and very dog friendly. Cottage was comfortable and very well equipped. Owners were friendly and helpful, providing ideas for walks and things to do in the area. Lovely views across the valley and the outside area was probably the best we have seen from a holiday cottage, with the private hot tub providing much needed relaxation after a long walk across Dartmoor! We hope to return! It was home from home for us, just because we have a dog we still want a lovely place to stay in. It was perfect for us in every way. It was spotlessly clean, beautiful white bedding and towels. It was the first time I have slep the first night ever anywhere I have stayed. We couldn’t fault it and will definitely go back to stay again. Richard and Ute were so friendly, they even left dog treats on the door for Molly. Flowers, milk, eggs, a bottle of wine and a delicious cake were left for us on our arrival, how kind and thoughtful. We enjoyed the hot tub and the sunsets from out Patio. It was a fabulous 5 days !!! My family and I (wife, two teenage children and a dog) stayed at the Cow Barn for just under a week. The Barn was beautifully set up, we really appreciated all the mod cons and little touches which made us feel pampered. The hosts had thought of everything to make the stay easy and comfortable. The hot tube was a big hit at the end of the day after a long walk, or visit to the beach. Whilst the weather was drizzly there was still plenty to do within 30 min of the Barn. For example, we went horse riding, walking up some stunning locations (Yes Tor), a beach (Constantine) and we visited Lydford Gorge which had a waterfall. Our dog was able to join us for all events and seemed to enjoy it all. The Cow Barn has a view of rolling hills, it is peaceful and feels private. The owners (Richard and Ute) are welcoming and knowledgeable. Their welcome pack was a welcome treat after the drive down. We will definitely visit again and would recommend this highly. 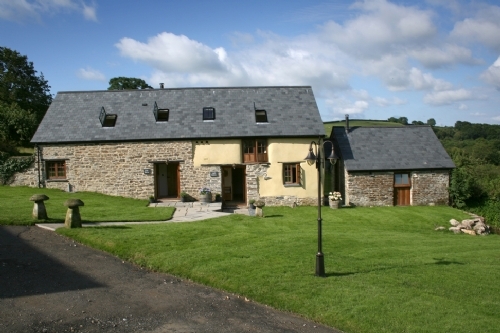 Well appointed Cottage in lovely location, the hot tub was an excellent facility to have, it was used most days. A fantastic place to stay , unwind and catch up with family and friends. Clean, luxurious and welcoming. Highly recommended! This place is a little gem. Great find! Everything was top quality from crockery to coffee machine. It is in such a perfect setting for peace and tranquility. A superb place to relax and recharge. Wish we had longer.